Get your aviator goggles on for your steampunk adventure in the city of gold with Fortunium, a 5 reel, 40 payline video slot from Microgaming. This is an exquisitely drawn game with elegantly dressed Victorian mavericks and treasures of sorts. Featuring an unusual 5 x 5 grid, Fortunium is loaded with special features like stacked symbols, mystery symbols, free spins and a Win Booster – which does exactly what it sounds like. With a high RTP of 96.47%, wins can be frequent to keep you fuelled. Get in on the action at one of these high-flying slot sites. As with all things steampunk, Fortunium has a slightly different way of doing things. But no worries, it’s not complicated at all. Set your bet by clicking on the silver coin on the right side of the screen. You’ll see that coin size ranges from £0.01 to £0.50, and you can bet 1 to 25 coins per line. All 40 paylines are active, and Fortunium has packaged everything together it so that the minimum bet per spin is at £0.10. This really isn’t much for betting on 40 paylines. If you want the Win Booster, it will be 50% more expensive and comes out at £0.15 per spin. We’ll describe the Win Booster in more detail in the Special Features section, but note that it’s the green button on the left of the screen, while the Spin is the red button on the right. The Fortunium jackpot is yours if you spin 5 scatters. We did the maths to reveal that it will deliver 66,66x (oh those devilish game designers!) so if you’re playing at £0.30 a spin, that’s 20 coins, multiplied by your total bet. If you’re using the Win Booster, if can go up to 100,000 coins. Ok, with that inventiveness of sci-fi culture, you can expect some pretty wacky additions to this game. So let’s get to what everyone’s waiting for: Fortunium’s special features. Mystery Symbol: These are the green and golden boxes with a question mark in them. When the spinning stops, they will reveal a stacked symbols, which can be anything, including Wilds. Win Booster: At any point, you can turn on the Win Booster by pressing on the green button. What it does is that it will increase the chances of mystery symbols that will only reveal high value symbols. Well, it costs 50% more of your total bet with each spin, so that if you’re playing minimum bet of £0.10 per spin, with the Win Booster feature it becomes £0.15. Is it worth it? It doesn’t really deliver any kind of instant gratification, but we still think it’s not a bad deal. £0.10 for 40 paylines is a really good deal to begin with and to throw in another 5 pennies for more high value symbols is pretty ok. If you’re on a more limited budget, you can still thoroughly enjoy Fortunium without turning on Win Booster. Free Spins Bonus: Land 3 or more Scatter symbols (the green gem) and you’ll enter a round of 10 free spins. In this round, there will be a Mystery Reels on reels 2, 3 or 4. 3 scatters get you 1 Mystery Reel, 4 scatters get you 2 reels, and 5 scatters will get you 3 reels. If you spin any additional scatter symbols during this round, you’ll be awarded an extra free spin. 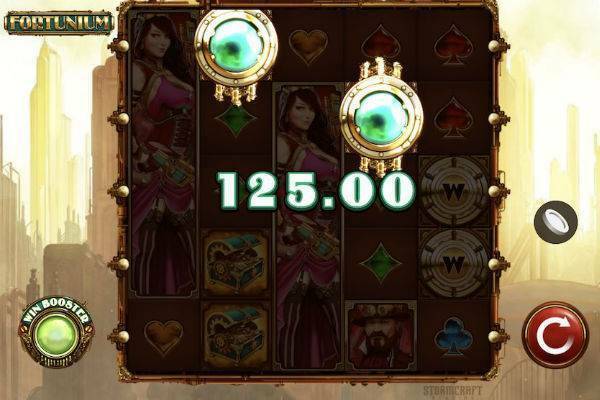 Fortunium has the richness of everything you would expect from a steampunk slot. The game is set in a somewhat apocalyptic but golden cityscape, with Maximilian and Victoria resourcefully decked out in velvety, colourful costumes of the Victorian era. When you hit the bonus round, you’ll be transported into the machine room that will take you up to the sky. Overall, this is a visually appealing game. The soundtrack is a bit generic, but the good news is that it’s quite low key, so it’s not too disturbing to have it running in the background. Overall, Fortunium is a fun video slot. The game has a shabby but luxurious feeling in the spirit of steampunk culture and sports a rather non-traditional 5×5 grid, which is used to deliver some tall stacked symbols. However, the main distinguishing feature here is the Win Booster, which for a small, extra price can add more high value symbols to help deliver bigger wins on a game that already has frequent payouts. 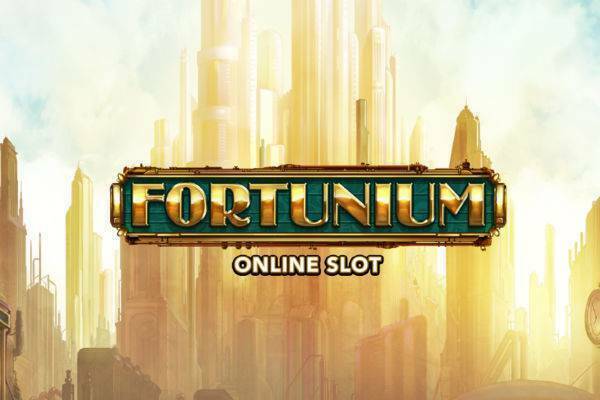 Take Fortunium for a ride at one of the online casinos recommended here.